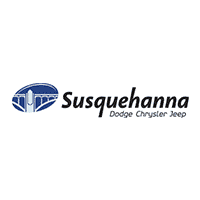 When you’re looking to buy or lease a new or pre-owned car, truck or SUV, be sure to come to Susquehanna Chrysler Dodge Jeep Ram! We have an incredible selection of new Jeep and pre-owned Ram models for you to choose from, and thanks to our top-notch Chrysler service team, we’ll make sure that the car you buy from us is in top condition for years and miles to come. Make the short drive to our Chrysler, Ram, Dodge and Jeep dealership in Wrightsville, PA, for an incredible car-buying or -servicing experience! To help better serve our customers, we recently built a brand-new, state-of-the-art facility to expand our inventory and help provide you with a more impressive selection of vehicles. If you’re looking for a new Dodge or Jeep SUV, we have plenty of options for you. Want a new Ram truck? Then test-drive a Ram 1500. Plus, we have a large inventory of pre-owned cars for you to choose from if you’re looking for something more affordable. When the time comes, also be sure to visit our Chrysler service center for regularly scheduled maintenance to keep your car in top condition for years to come. Our knowledgeable sales, finance, service and parts teams are here to make car ownership easy. Come see our brand-new dealership and find the car that’s right for you today! Our brand-new facility provides you with a better car-buying and -servicing experience. We have more space for vehicles on our lot and have a state-of-the-art service center! If you display a Susquehanna Chrysler Dodge Jeep Ram front license plate bracket or a decal, you automatically are a member of our Customer Rewards Program. With this perk, every other oil change will be free! If your car is coming in for an extended service stay, you’ll get a courtesy loaner vehicle at no extra cost. All of our loaner vehicles are in top condition and none are older than six months. If you’re coming in to buy a commercial Ram truck or another fleet vehicle, we have a dedicated commercial vehicle sales team to help you with all your needs.